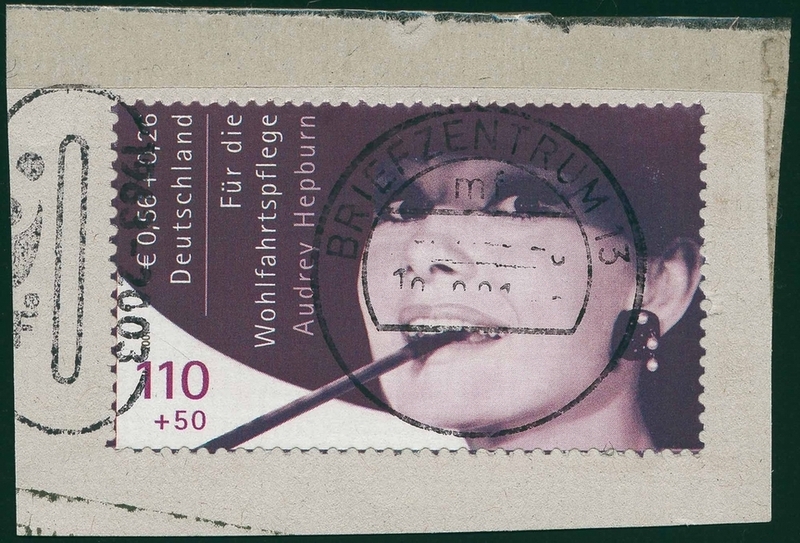 A commercially used copy of the world famous unissued charity stamp "Audrey Hepburn" of 2001.
among a bunch of clipped envelope corners which he had kept untouched for a couple of years. who has already auctioneered 2 pieces of this great rarity in 2005 and 2006. The buyer in 2005 paid incredible EURO 170,000 (USD 209,000) for his corner piece. on the occasion of the Sindelfingen International Stamp Fair (Oct 26 - 28, 2007, booth 62). The stamp is preserved still on its original envelope cut-out and goes with a clean certificate by philatelic expert Andreas Schlegel.